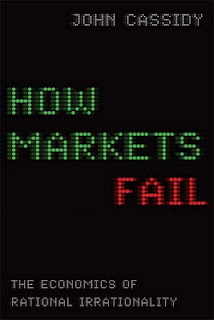 It looks like John Cassidy's latest book, How Markets Fail: The Logic of Economic Calamities, is worth checking out. According to Cassidy, it was blind faith in the markets that caused the recent financial meltdown. He argues that we can avert future calamities via 'reality-based economics'—grappling with market failures, disaster myopia, speculative frenzies, and other economic complexities. In this sense Cassidy can be called a Keynesian; it was John Maynard Keynes, after all, who fathered economic-crisis management. Cassidy agrees with free-market advocates that the market performs wonders, but he believes its reach is limited. In that spirit, he favors greater government regulation of the financial-services industry. Although he doesn't dwell much on practical ideas for reform, he argues that it's necessary to tame Wall Street now that financiers have learned they can privatize profits during good times and socialize losses in bad. He admires the changes that came out of the Great Depression, such as the Glass-Steagall Act, which separated banking from investment banking. Even if current legislators aren't willing to go that far, banks must be required to keep more capital on hand and be given limits on how much debt they can accumulate, he says. He considers the proposed Financial Product Safety Commission a sensible idea. "The proper role of the financial sector is to support innovation and enterprise elsewhere in the economy," he writes. "But during the past 20 years or so, it has grown into Frankenstein's monster, lumbering around and causing chaos." Essentially, Cassidy is suggesting that a return to hands-off economics would be a disaster. His views mirror my own, namely the suggestion that, left to its own devices, and without oversight, blind market forces will eventually eat itself. Strike another victory against the advocates of market libertopianism. It's great that we're having this conversation, because market failures are real and there's a serious question of how we should deal with them if taxpayers are going to wind up footing the bill. But there's some serious problems with Cassidy's analysis that is characteristic of many market naysayers. For one, he's exhibiting the same reverse myopia I've heard again and again. This may be one of the largest recessions in history, but it's certainly not new. Read Carmen Reinhart's "This Time is Different" for a look at financial crises across history. We always say "ok, time to reign in the bankers, we can't let this happen again", and it always does. This isn't an argument for unfettered markets of course, it's more an argument that curing market failures is a hard problem, and glossing over solutions with banker bashing platitudes does more harm then good. And of course all this ignores the very important question of which is worse: market failure or government failure? Finance is already one of the most heavily regulated industries in the entire world. Governments are if anything even more prone to creating perverse incentives than bankers. Obviously we need to try something, but we really need to think hard about our solutions before we try them. The current economic crisis started with U.S. politicians urging the banks to give money for buying houses to many, many people who cannot afford it. Is this "blind faith in the markets"? No, it is not. It is stupid and unscrupulous politicians. Yes, we need "greater government regulation of the financial-services industry", but, more important, we need greater regulation of politicians. Below is a letter I sent some months ago to my local paper. Everyone is asking how the world has come to the present financial crisis. a) In hunter-gatherer populations there was a direct physical relationship between effort and reward. b) Once barter systems evolved we were on the slippery slope, because we ourselves, and not our relationship with the physical environment, determined the value of bartered objects. c) When the magical pieces of paper and metal discs were introduced physical effort and reward completely parted company and the majority of the world's population and biosphere fell pray to the parasitic money jugglers. d) The situation now exists whereby someone with one finger on a keyboard can buy a piece of land by sending symbols through cyberspace, and without a single thing physically changing, after the passage of a few years, perhaps double the money he paid for it. What does that profit represent in terms of physical effort and change? Everything has become so symbolic and abstract that there is no longer a direct and balanced physical relationship between effort and reward - between the number of abstract units (money) and the physical reality they are purported to represent. The modern economic system is a religion which, as we have seen throughout its history, depends as much on faith as it does on reality. I have pointed out, in letters to this column in the past, that our economic system is like a massive pyramid scheme in which a few individuals at the top become rich on the backs of those at the bottom - the whole thing driven by the amazingly stupid assumption that it can function to infinity. We cannot continue to borrow and steal from the future as the natural economy of a finite earth and its biosphere will ultimately determine if mankind has a future. If we carry on along the same path, I cannot see anything other than a final catastrophic collapse and a bloody return to subsistence farming. It has to be admitted that the prosperity of the first world has been brought about by the financial dealings of those who have been parasitic on the mass of humanity and the biosphere, but sadly these individuals are also the reason why we will lose all that we have gained. If humanity is to exist in relative comfort for a long time into the future, the only answer is to index money more closely to the realities of the physical world in some form of steady state economy.